Inspired by the great New England IPAs, after aroma, mouthfeel is probably the second thing I look for in a great hop forward beer. Malt profiles are important, but subtle tweaks are hardly noticeable in a heavily hopped beer and for the most part I don’t care for a lot of malt character anyways (my preference of course). IBU levels are also important, but I have a hard time detecting a difference in slight IBU changes from one beer to another or even whirlpool addition changes. Changes in mouthfeel on the other hand can be very easy to detect, but not always easy to achieve. A hoppy beer with an extremely soft and silky-like mouthfeel is one of the main characteristic traits distinguishing a New England IPAs from a traditional IPA. To my palate, this softness quality seems to aide in rounding out a beers bitterness to flavor levels helping to make the overall experience a little more in balance and elegant. I hear a lot about beers being in balance in terms of malt to hops, but I really have no idea what this means. What does resonate with me though is this idea of bitterness being balanced with hop flavor and I’m inclined to think that mouthfeel softness helps meld this ratio. I haven’t always been after a soft mouthfeel in IPAs; I’ve evolved (to steal a politician’s word). just a few years ago I was brewing heavy sulfate IPAs and trying to get them as dry as possible, mostly because this is what I was reading on blogs and listening to on podcasts on the best methods. Don’t get me wrong, I enjoyed these beers, but as I got the chance to try some of the great New England IPAs I was immediately questioning my current methods. The incredible soft mouthfeel these beers had really seemed to bring the flavors to the forefront and the bitterness seemed to only aide in the impression of a hop saturated flavors. I, like many others, were obsessed with this quality in the New England hoppy beers and started chasing a softer mouthfeel, and this post documents my experience and research on the topic. I almost completely focus my brewing on hoppy mid-low ABV flavorful beers. Of course I still brew and really enjoy aged sours and tart saisons, but the majority of these beers get solid dry-hop treatment as well! This focus on basically one style has really been valuable (I think) in being able to constantly tweak these beers in various ways in an attempt to improve them. Every beer I brew I record my scores from 0-5 in a number of categories as a way of scoring all the various aspects of the beer. I rank everything from bitterness levels, hop aroma detectability, minerality, stability, clarity, hop oil information, aroma characteristics, head retention, excitement level, etc. I mention this overly obsessive rating system because in a previous post, I looked at 25 batches of beer all fermented with WLP002 and examined what factors had the biggest influence on final gravities with the English yeast strain. 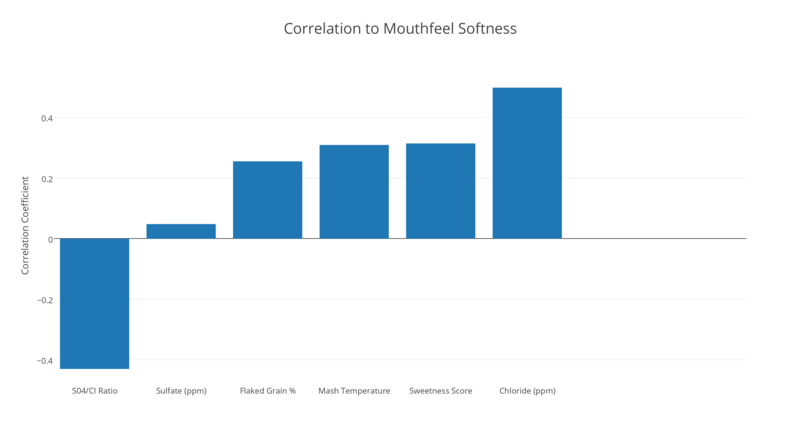 For this post focused on mouthfeel, I decided to look at the same 25 batches, all with WLP002, and examine what factors had the biggest impact on my mouthfeel softness scores. I also looked at a few studies on the subject in an attempt to put a little academic data behind my results to see if they stack up or not. One main reason I chose to focus on this set of 25 batches is because recent experience (as well as the experience of others) has shown me that yeast choice alone can greatly influence mouthfeel. So focusing on beers all fermented with the same yeast strain avoids the yeast factor altogether. Keep in mind that many of these beers were created and tested before and after I started attempting to achieve a softer mouthfeel in hoppy beers, so although you’re always tempted to rate things higher when you’re trying to achieve a certain goal, many data points were entered without this stated goal even in mind or prior to me even tasting a New England IPA. Below are the results from correlating the data from the 25 batches to different brewing process changes to the mouthfeel score I gave each beer. Below the chart is a more in-depth look at each process change and possible explanations for the results. As you can see from my experience, calcium chloride alone had the biggest impact on increasing my mouthfeel softness score. 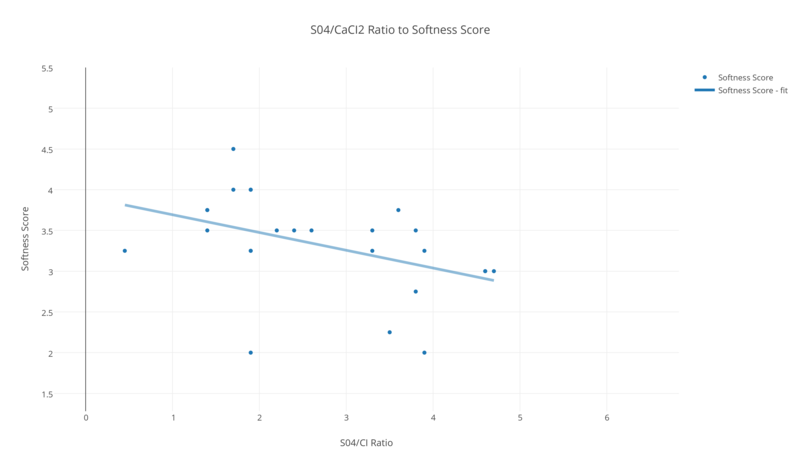 As the grams/gallon of calcium chloride (CaCl2) increased, so did my softness rating. The same is true with the gypsum/calcium chloride ratio (S04/CaCl2), as the ratio of gypsum to calcium chloride decreased (negative relationship) so did my mouthfeel softness score. In the 25 batches looked at above, the S04/CaCI2 ratio ranged anywhere from 4.7:1 to 0.45:1. As the scatter chart of these beers below shows, I had the most successes in terms of softness when the ratio was around 1.5:1, which is close to an even split of gypsum/calcium chloride. I’ve recently tried a batch with 100% calcium chloride, which wasn’t the slam dunk as I thought it might be, I definitely considered the mouthfeel soft, but it wasn’t enough to convince me there isn’t a role for sulfates in hoppy beers still, what that role is I’m not sure yet. An article in the Journal of Automated Methods & Management in Chemistry furthered the notion of using less sulfates in hopped beers. The article states that “an excess of sulfate gives a sharp, dry edge to well-hopped beers and the level present should be minimized as much as possible.”5 Unless your goal is dryer sharper IPAs, this seems like further proof to lower the levels of gypsum in hoppy beers. My personal experience with heavy sulfate hoppy beers are that the hop flavor is reduced and the bitterness perception increases becoming harsher as the level increases. I think it’s fair to say that most brewers will add all of their mineral additions to the mash, possibly splitting the additions in two, treating the strike and sparge water separately. What if we approach it in the same way but withhold a portion of the calcium chloride addition and add it directly to the boil? With no grains from the mash acting as a filter of sorts removing some of the chloride, it seems possible this direct addition to the boil could enhance the softness effect. I’ve experimented with adding the calcium chloride addition calculated for the sparge water only directly to the boil, but have backed that number down a little. It may be I’m sensitive to minerality in beers, but now I’m targeting around 4 grams of calcium chloride or less directly into the boil for a 5 gallon. So I’m withholding about 3.5-4 grams of the chloride addition from the sparge to add to the boil for a 5 gallon batch with reverse osmosis water. My last attempt at this was for a S04/CaCI2 ratio of 0.8:1 (111.6 ppm Sulfate and 131.5 ppm Chloride). [UPDATE: I’ve tried adding the sparge water minerals directly to the boil a number of times and wasn’t thrilled with the results. I felt like I was getting more a mineral taste to the beer which seemed to be enhancing the dryness a touch more than I wanted. I now treat just the mash and sparge water and don’t add anything directly to the boil]. As far as the optimal level (ppm) of chloride to have in a beer, I’m not sure. A 1971 journal recommended a level of ~200 mg/L of CaCl2 to produce a lager with a proper mouthfeel.6. This recommendation seems a little high based on my own experience and it’s for a lager (and dated). The highest I went in the 25 batches examined above was 182.5 ppm. I have a good friend and great brewer who has gone as high as 250 ppm of chloride without success describing the beer as medicinal and astringent. It might also depend on how much gypsum you’re adding to the beer as well. Lastly on calcium chloride, to experiment with chloride you can always try adding a little to your beer after fermentation (directly to a pint) to see if you like what the elevated levels does for the beer. You can also try adding it to other liquids like coffee to test its softness ability. I gave it a shot in a CHEMEX with reverse osmosis water, I added less than a gram of calcium chloride to 600 grams of reverse osmosis water and 40 grams freshly coarse ground coffee. Sure enough, it was a little softer and fuller (although I was probably looking for this, I should have added it directly to cup and done a side-by-side). I might just start adding some chloride to coffee all the time now (I brew coffee with R/O water as well). I was surprised to see my rating of a beers sweetness increase along with my rating of a beers softness. Although only considered a positive weak relationship (correlation coefficient = 0.314), it still intrigued me to look into this result a little more. A study analyzing the anions in beer noted that, “If the level of chloride is > 250 mgl, then this level can enhance the sweetness of the beer but it hinders yeast flocculation.”8 My results would tend to agree with this as I associated increased chloride with increased softness as well as sweetness, although the 250 mgl of chloride still seems high to me. As a side note, the last statement from the study on increased chloride hindering flocculation is very interesting; perhaps it’s not just the yeast alone that is helping these great New England IPAs with the haze (for better or worse). There is evidence to suggest that yeast cells have the ability to strip hop oils from beer so an unflocculent yeast strain combined with increased chloride would seem like a logical move to enhance hop impression as well as softness and sweetness (at the cost of more haze it sounds). Why would you want sweetness in a hop forward beer? I can only speak for myself, but I absolutely don’t mind sweetness in hoppy beers, in fact I might prefer it. Although many want their IPAs really dry and attenuated, I think a higher finishing gravity isn’t a bad thing in a hop forward beer. 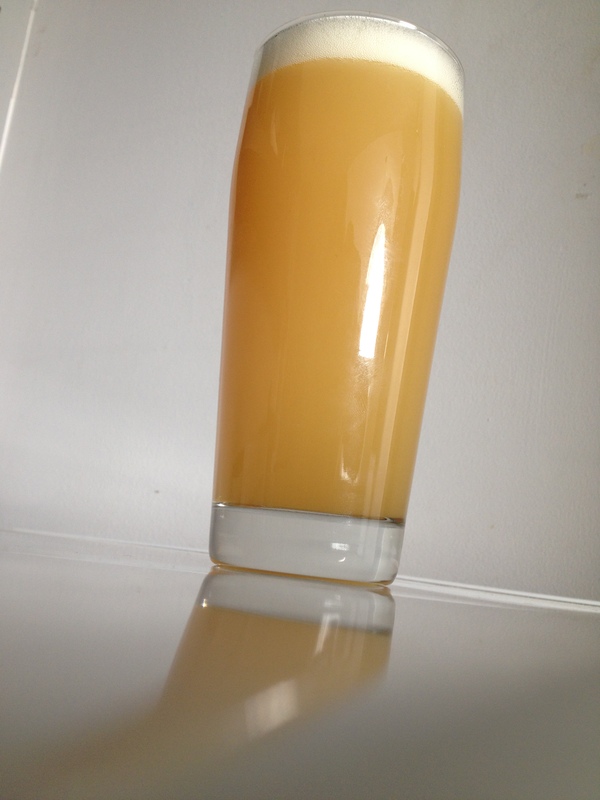 For one, it might enhance the perception of softness according to my experience, but mainly when I think of a great New England IPA I think of huge tropical and citrus aromas, which naturally should (I think) follow with a sweet more fruit like finish/taste. Who likes oranges that are dried out and lack sweetness? By the way, if your oranges taste and smell like beer now, you should probably be eating more fruit and drinking less beer! Low finishing gravities doesn’t always appear to mean dry non-sweet tastes however, which I discuss in more detail below. The mash temperature in the beers examined above had a relationship (although weak) to the softness of the mouthfeel (correlation coefficient = 0.309). From the previous post I learned that the highest correlation to the final gravity of each batch fermented with WLP002 was the mash temperature (Correlation Coefficient = 0.504), which isn’t surprising. However, the higher the mash temperature, the higher the eventual finishing gravity, which then generally meant I tended to score the softness slightly higher. Although not included in the chart above, this would agree with how I scored each beer’s overall mouthfeel’s thickness (another separate scoring I do for each beer), which highly correlated to the softness score (Correlation Coefficient = 0.825). Essentially, to my palate, the higher the finishing gravity the softer I tended to perceive the mouthfeel. Keep in mind this is a weak relationship, but maybe this is part of the puzzle? I’m not convinced the final gravity concept is as important to the beer’s softness as the numbers might seem to imply. I’ve had beer with incredible soft and airy mouthfeel despite having a low final gravity. For example, I degassed and tested Alien Church, an excellent IPA brewed by Tired Hands in Ardmore, PA and I considered the mouthfeel very soft despite a final gravity of 1.006-7. I like to play around with using a variety of flaked grains in beers with varying percentages of the total grist. I’ve experimented with using flaked spelt, flaked rice, flaked rye, flaked kamut, flaked quinoa, and flaked oats. For this figure, I calculated the total percentage of flaked grains in each batch (many times I combined different flaked grains in one batch) and correlated this number to the softness score for each beer. Another weak positive relationship (correlation coefficient = 0.255) resulted from this calculation weakly implying that as the total percentage of flaked grains in a beer increased, so too did my rating of the beers softness. Specifically, beers ranging from about 14-20% total flaked grains in the grist seemed to rate best. Keep in mind though this relationship is considered weak, so perhaps another small factor to consider when formulating recipes with the intention of increasing softness. Interesting to me was that there was a stronger correlation with flaked spelt (Correlation Coefficient = 0.361) and flaked oats (Correlation Coefficient = 0.222) to my perception of softness than with the other flaked varieties, although I tended to use these flaked varieties more often. I’ve also had success with malted spelt that seemed to aid in the mouthfeel the few times I’ve used it. Osmotic stress on the yeast increases glycerol production (high gravity beers). All of this seems to indicate that the level of glycerol in your beer can influence the mouthfeel fairly substantially as well as the taste perception of a beer. I would warn however this whole concept is new to me and I have seen zero information on individual commercial available yeast strains and their ability or lack of to produce glycerol and at what measured levels. Having said that, my experience has shown me that yeast selections can greatly influence the mouthfeel perception of beer, which would appear to agree with the benefits of glycerol explained above. In fact, I recently purchased a 6-pack of a local breweries Grisette on mouthfeel alone. After learning the breweries yeast selection was likely Wyeast French Saison 3711 (which is rumored to have increased glycerol levels) I purchased a vial to experiment with. It’s not just New England IPAs I enjoy a great mouthfeel in! @ScottJanish French Saison (Thiriez). Spelt, flaked wheat, cara pils and our well water also contribute. Langstaff, S. A., & Lewis, M. J. (1993). 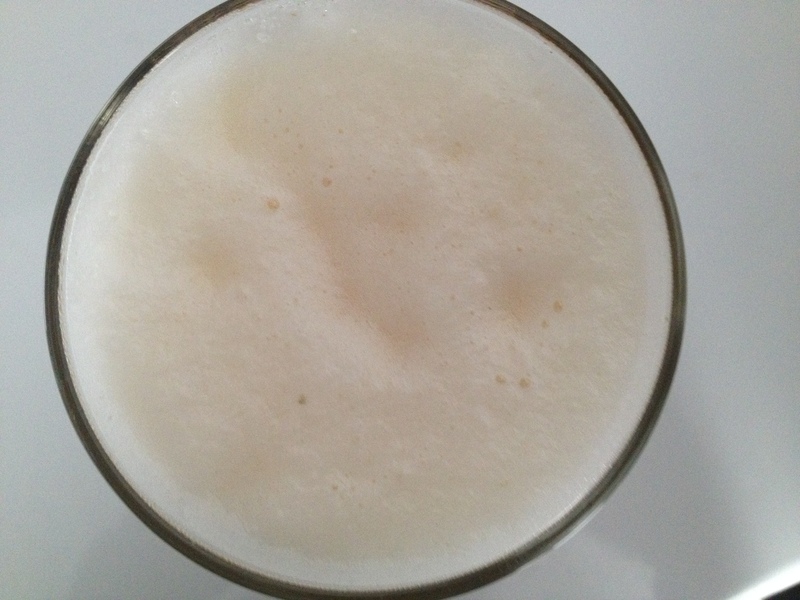 The Mouthfeel Of Beer – A Review. Journal of the Institute of Brewing, 99(1), 31-37. Langstaff, S. A., Guinard, J .• x. & Lewis, M. J. Journal of the lrutilllte of Brewing, 1991, 92, 168. Bruce, J. (2002). Analysis of anions in beer using ion chromatography. Journal of Automated Methods & Management in Chemistry, 24(4), 127-130. H. (2010). Maximizing Hop Aroma and Flavor Through Process Variables. Technical Quarterly TQ. Ragot, F., Guinard, J.-X., Shoemaker, C. F. & Lewis, M. J. Journal of the lnstilllte of Brewing, 1989, 95, 427. Scanes, K., S. H., & B. P. (1998). Glycerol Production by the Yeast Saccharomyces cerevisiae and its Relevance to Wine: A Review. Zhao, X., Procopio, S., & Becker, T. (2015). Flavor impacts of glycerol in the processing of yeast fermented beverages: A review. J Food Sci Technol Journal of Food Science and Technology, 52(12), 7588-7598. Parker, W. E. & Richardson, P. J. Journal of tile Institute of Brewing, 1970, 76, 191. Gawel, R., Sluyter, S. V., & Waters, E. J. (2007). The effects of ethanol and glycerol on the body and other sensory characteristics of Riesling wines. Australian Journal of Grape and Wine Research Aust J Grape Wine Res, 13(1), 38-45. Freeman, G., & Donald, G. (n.d.). Fermentation Processes Leading to Glycerol. Retrieved June, 1956. Hi Scott…I’m in the same boat as you regarding a wonderful soft mouthfeel for my hoppy ales. I’ve also been chasing this with some success as you, but still feel like there’s something slightly missing. I remember sometime mid-last year where I think some people might have missed a bit of good info from Shaun. I replied to a tweet that Shaun posted showing a little video of a bunging valve on one of his fermenters. He replied saying it was being held at 5 psi, and about to increase the pressure. I’ve always wondered if this could also help with mouthfeel in his beers. It would allow him to ferment at a higher temp, allowing more Glycerol production, also allowing him to reduce ester production. This could allow him to be selective with a yeast strain, and not worry about too much ester production. He also gets the benefit of naturally carbing, or at least getting a head start on carbing, and finishing it off in his bright tanks? I’ve also wondered if he’s done anything on the mashing side with regards to rests to help achieve the mouthfeel profile he’s after. Anyway, we know it’s not just one thing, and surely a combo of many things. Just throwing my thoughts out there! Brian – That’s interesting, thanks for sharing. I haven’t come across any papers that outline the benefits of pressurized fermentations (but now I’m curious). Greg Foster at Brulosophy had an article on this subject (http://brulosophy.com/2015/04/27/under-pressure-the-impact-of-higher-psi-fermentations-exbeeriment-results-2/) and it didn’t seem have impact at 6 PSI. I’m curious how much warmer you could raise the temperatures with this method. Definitely one more possible piece of the puzzle to consider and experiment with! Scott – could you post links to some of the research about pressurized fermenting? I just built a small 200 L system and am doing my first pressure fermentation right now. Anecdotally, I think the mouthfeel is very soft. Questions I want to explore: how much higher can I ferment? When can cap the pressure release to fully carb the beer? I’ll keep an eye out for pressurized fermentation studies. I’m not seeing anything after a quick search right now, but I’d like to learn more about this as well. Appternaly this is what the esteemed Willis was talkin’ ’bout. I want a full mouthfeel, but not soft in my IPAs. I want a bite to them. Otherwise I feel the ,malt becomes too clying. That’s why I use WY1450 for pretty much all AIPA I make. Denny– I know it’s personal preference, but if you’ve ever had Hill Farmstead, you’ll see how amazing the mouthfeel is. I’m lucky to be close enough to get it. It’s a beautiful soft pillowy mouthfeel. Full, but not heavy. Hard to describe, but it’s not cloying sweet. In fact, the malt is very much in the background. His beers are delicate, and dialed in perfectly. Everything from bitterness, aroma and flavor are perfect. Your palette doesn’t tire from it, and makes you want to come back for more. BTW, I think you meant sulfate, not sulfite, in the article. Great article. If you are looking for a saison strain with a lot of glyserol you should try 3726 from wyeast or just harvest it from a bottle of blaugies. It routinely finishes at 1.003 or lower for me and never produces a thin feeling beer despite thr attenuation. Always a soft pillowy rounded mouthfeel. Probably has something to do with my water but I feel like it has to have a lot to do with thay yeast as well. After reading a few threads on 3726, it looks like your not the only one who experiences a little extra body despite such a low finishing gravity. How is the “saison” quality of the yeast (peppery, tart, funky)? It’s very earthy, some clove, does have a bit more tartness than most strains I’ve tried, when fermented at higher temps it produces some juicy fruit/ apricot notes as well. You didn’t happen to take PH readings of your strike water when brewing these beers? The additions to your water are effecting the PH and the before/after readings would help others replicate your results. I could do the same mineral additions to my water when brewing but may come out with vastly different results because of my starting PH levels. Any insight would be nice, thanks for your hard work! Tim, unfortunately I didn’t take pH readings of each of the beers I mentioned in this post. The most recent NE style IPAs batches I have brewed (and been happy with the mouthfeel), I had pH readings of 5.3-5.45 taken about 40 minutes into the mash (with the addition of a little bit of acidulated malt). I know many shoot for a slightly lower pH. I also use reverse osmosis water and build up the minerals from there, the last time I used the following Water: .75 g/gallon gypsum & 1.0 g/gallon calcium chloride and withheld 3.7 grams of the sparge water addition and put it directly to the boil pot in hopes of boosting the softness. I hope that is helpful. Your writeup is definitely helpful and i look forward to trying your gypsum to CaCl ratio to see how it comes out. My only concern would be how those chemicals effected the overall PH of the mash and if PH has any correlation between your mineral additions and mouthfeel. I’ll see how my brew goes this weekend, hopefully my water profile is close to yours and i can get similar soft mouthfeel results! A little late to the party, but I was wondering what else you add to your RO water apart from CaCl, and gypsum. Just calcium chloride and gypsum in hoppy beers, sometimes no gypsum at all. It seems to me that what’s being employed here are tecniques and profiles in Czech Pils. A soft water profile is going to afford a soft and pillow like mouthfeel. Throw in all the flaked grains and you have one of these gravy boat IPA’s. yeast leaving just a slight amount of unfermented extract. Low ion water provides a distinctively soft, rounded hop profile despite high hopping rates. Have you tried to make one. Not so easy. American hops yes. Now what do you do with them. There’s talk of varying whirlpool temps from 180F to 120F. Hop back editions. 0%, 50%,75%, and just before cold crashing, additions. Oh and keg additions under slight pressure. And many more. And that’s just hops. Regarding the 1.5:1 sulfate to chloride ratio, is that to be targeted in the final wort volume after the boil? Don’t most discussions of water composition focus on salt composition at mash time? Would one want to calculate the salt additions for the final volume, and then apply those to the mash and/or pre-boil volume? The 1.5:1 figure is referring to all the water used for brewing. I’m using R/O water so I’m using that ratio to treat both the strike and sparge water volumes. Firstly, I have recently discovered your blog and have been working my way through your posts. Fantastic stuff!!! Personally I have been experimenting with a lot of the factors that you have as well. Two things you have not examined in this article which I believe can have a significant effect on mouth feel/softness and bitterness perception are carbonation and PH. Do you have the record of these for your beers? I think you are correct that both the pH and carbonation level can play a role. I do take pH readings of my finished beers and for me (at least with the NEIPAs) I tend to like the pH a tad higher (4.4-4.6). The higher pH can also enhance the bitterness perception, which is something to keep in mind. As far as carbonation, I usually aim for 2.5 volumes. I don’t mind a slightly lower carbonation level in these beers as it seems like it can also enhance the mouthfeel a touch the less “spritzy” it is. How does your experience compare? I have found that a lower carbonation definitely gives a smoother mouth feel. I have been happy with 2.2vols for a smoother hoppy beers. I believe ph is very important the the whole way through the brewing process (from mash to glass). A lower ph in the kettle lowers the utilisation of alpha acids, but in my experience it does not lower essential oil extraction. It also seems to smooth the perceived bitterness as well. I have been targeting a lower starting kettle ph (5.1-5.2) which will drop 0.1-0.2 over the boil. Because dry hopping increases the final ph of the beer it will also change the final perception of the beer. I have been targeting a lower ph to help counter act this as well. I would like to get a clarification on you ratio. You happen to write chloride and referring to CaCl2 (Calcium chloride). You also refer to sulfate which is SO4-2, an anion that come from gypsum (CaSO4) if I got you right. The question is simple, when you write your ratio, which chemical species is taken into account here? As ppm refer to mass and molar masses are different for SO4-2, CaSO4, Cl- and CaCl2, we may have plenty of different ratio involving the same starting amount of salts. Actually, are you using SO4/Cl ratio or CaCO4/CaCl2 ratio? In your graph and summary you wrote SO4/CaCl2 ratio that is confusing. Thank you for your work on reviewing all that literature, I get to read a couple of these papers and this is good stuff! Again good work! Everything in the post refers to Gypsum/Calcium Chloride, so it would be CaSO4/CaCl2. Well written and very informative, thanks so much! Hi! Great read, thanks! I was wondering if you or anyone youve heard of tried adding glycerol to the finished beer for a greater mouthfeel? I sell the stuff so I got curious.. if not, i might have to try It. I’m currently designing a New England IPA recipe, and I’ve heard a good ratio is 1:2 sulfate to chloride, so I decided on 80ppm sulfate, 160ppm chloride. Along with flaked corn, flaked oats ,flaked barley and cara-foam. I’m hoping to have a silky smooth New England IPA. I’ve been doing some research to help improve my brewing. I’ve come across a couple of your posts. Very well done. Thanks for taking the time to research, write and post. CHEERS!